Inspired by cultures around the world, Shangri-La Woven Wood collection encompasses any decorating style. Window fashion sindia making all natural fibers products. Coir carpets and Coir mats. Inspired by today's classic design influences and the need to bring more natural elements into the home or office. Made from exotic bamboos, woods and reeds, woven Shades are full of rich textures, beautiful colors and natural style that bring nature indoors- adding a warm, rich dimension to any room. 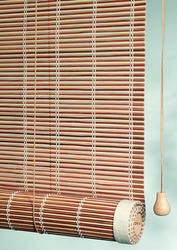 Available in traditional roll-ups style and modern roman style. 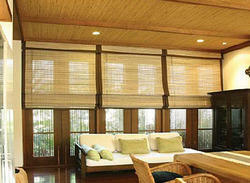 Manufacturing a unique range of bamboo blind, we offer distinctive styles giving a casual and refined appearance to the room décor. Nicely knitted bamboo with in a cord, natural fluctuation and color make each blind look unique.